Flourens found that it did not matter where he lesioned inside cortex; what mattered was how much he lesioned. This suggested that functions were equally distributed (the law of equipotentiality) and widely distributed (the law of mass action) across cortex. Lashley updated this research by acknowledging localized functions in primary sensory-motor cortex (see tomorrow's entry), labeling the rest of cortex 'association cortex'. Modern research has shown that Flourens and Lashley just weren't looking hard enough. Equipotentiality does not hold true (i.e, there is specialization within association cortex), but there is a great deal of mass action in the form of distributed network interaction across association cortex. Implication: The mind is implemented in an electric organ with distributed function. This post is part of a series chronicling history's top brain computation insights (see the first of the series for a detailed description). Galvani (whose name inspired the word 'galvanize') discovered that electrically shocking frog nerves made their muscles move. Rolando used this same method to stimulate cortex in the brain. As has often occurred in history, the latest and most mysterious new technology was used to explain brain function. Here, at the turn of the 19th century the brain was "explained" as a mysterious electrical device. Later it will be "explained" as a telegraph with its many communicators (neurons) and wires (axons). Then it was described as a telephone network, with switchboards acting to control the flow of information. Eventually, with the cognitive revolution, it was compared to a computer. Finally, today, its complex and distributed network architecture is compared to the internet. Though each new comparison is always premature and inadequate, new insights nonetheless seem to derive from each analogy. What new technology of tomorrow will be used to describe brain function? Implication: The mind is implemented in an electrical machine-like organ. It is hard to maintain historical perspective as neuroscience progresses. Today's complications and confusions seem to cloud the clear insights of the past. This is inevitable when trying to understand the brain, the most complex computational device known. The plan here is to highlight history's major brain computational insights in the interest of integrating them into a single description of what we know to date. This description will concisely summarize what science has learned about brain computation. Neuroscientists, artificial intelligence researchers, psychologists, and many others will hopefully find it helpful for gaining perspective and integrating concepts important for their research. Laymen will likely find it useful for learning the major findings in cognitive neuroscience. The description will be necessarily biased by my own perspective, and will overlook many important contributions for those that clearly add to our understanding of how the brain computes behavior. Feel free to modify/add insights in the comments section. The plan: One insight per day (in historically chronological order) for the next month, culminating in a single large post listing and integrating them all. It is ironic that some still wonder if there is anything more to the mind than the brain when a man at the dawn of civilization and science could figure it out. One needs only to see a few brain damaged patients, try a drug (like alcohol), or see someone knocked out from a head/brain trauma to be convinced. Implication: The mind is implemented in a biological organ. All neuroscience with non-human subjects is theoretical. If the brain of a mouse is understood in exquisite detail, it is only relevant (outside veterinary medicine) in so far as it is relevant to human brains. Similarly, if a computational model can illustrate an algorithm for storing knowledge in distributed units, it is only as relevant as it is similar to how humans store knowledge. It follows from this point that there is a certain amount of uncertainty involved in any non-human research. An experiment can be brilliantly executed, but does it apply to humans? Circumventing this uncertainty problem by looking directly at humans, another issue arises: Only non-invasive techniques can be used with humans, and those techniques tend to involve the most uncertainty. 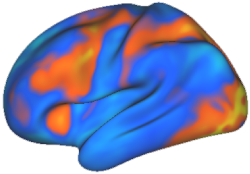 For instance, fMRI is a non-invasive technique that can be used to measure brain processes in humans. However, it measures the oxygenation levels, which is only indirectly related to neural activity. Thus, unlike with animal models, measures of neuronal activity are surrounded by an extra layer of uncertainty in humans. So, if you're a neuroscientist you have to "choose your poison": Either deal with the uncertainty of relevance to humans, or deal with the uncertainty of the processes underlying the measurable signals in humans. I thought this article at Howstuffworks was appropriate just after the all day drinking fest that is St. Patrick's Day for many. According to the article, a hangover from a heavy night (and/or day) of drinking is mainly due to dehydration. The dehydration process begins with a chemical reaction in the brain; specifically the pituitary gland. This reaction causes less vasopressin to be released from the pituitary gland, which in turn causes the kidneys to send water directly into the bladder (rather than reabsorbing it). So why do hangovers cause headaches? Apparently the massive amount of dehydration by the morning causes the body's organs to steal water from the brain. According to the article, this causes "the brain to decrease in size and pull on the membranes that connect the brain to the skull, resulting in pain". This cannot be good for neuronal health! Based on this information it seems that the best way to avoid a hangover is to drink plenty of water along with those heavy booze. There are other things (e.g. electrolytes) that are lost along with H2O, however. I'm not convinced that these really work, but some hangover prevention pills on the market may help to avoid losing these essential chemicals. Each type of drink has a different kind of hangover associated with it, according to this article. Red wine and dark liquors have the worst side effects, while vodka is the least likely to cause a hangover. If these articles are right, a good way to drink without getting a hangover is to take shots of water between shots of vodka (no one could tell the difference! ), and maybe add a little orange juice (making a screwdriver) to add some electrolytes back into the mix. Anyone care to test out this theory…? News about a neuroimaging group's attempts to predict intentions hit the wire a few days ago. The major theme was how mindreading might be used for unethical purposes. What about its more profound implications? If your intentions can be predicted before you've even made a conscious decision, then your will must be determined by brain processes beyond your control. There cannot be complete freedom of will if I can predict your decisions before you do! Dr. Haynes, the researcher behind this work, spoke at Carnegie-Mellon University last October. He explained that he could use functional MRI to determine what participants were going to decide several seconds before that decision was consciously made. This was a free choice task, in which the instruction was to press a button whenever the participant wanted. In a separate experiment the group could predict if a participant was going to add or subtract two numbers. In a way, this is not very surprising. In order to make a conscious decision we must be motivated by either external or internal factors. Otherwise our decisions would just be random, or boringly consistent. Decisions in a free choice task are likely driven by a motivation to move (a basic instinct likely originating in the globus pallidus) and to keep responses spaced within a certain time window. Would we have a coherent will if it couldn't be predicted by brain activity? It seems unlikely, since the conscious will must use information from some source in order to make a reasoned decision. Otherwise we would be incoherent, random beings with no reasoning behind our actions. In other words, we must be fated to some extent in order to make informed and motivated decisions. Most researchers in neuroscience use animal models. Though most neuroscientists are interested in understanding the human brain, they can use more invasive techniques with animal brains. In exchange for these invasive abilities they must assume that other animals are similar enough to humans that they can actually learn something about humans in the process. Functional magnetic resonance imaging (fMRI) is a non-invasive technique for measuring changes in local blood flow (which are significantly correlated with changes in neural activity) in the brain. fMRI measures what is called the blood oxygen level-dependent (BOLD) signal. Because it is non-invasive it can be used with human subjects. Researchers like ourselves recognize the value of animal research, especially when the behavior being investigated is similar between the studied species and humans. However, there is at least one fundamental cognitive difference between humans and all other animals, and likely many more given the dominant position of our species. For researchers like ourselves it is much more interesting to learn something about the human brain (the item of interest) rather than, say, the rat brain. Why do some neuroscientists think that using fMRI to study the neural basis of cognition in humans is of little value? Many have heard that there are issues with fMRI as a technique. There are (like any technique), but not as many as most believe. Most neuroscience writing touts statements like 'the human brain is the most complex object in the universe'. This serves only to paint the brain as a mysterious, seemingly unknowable structure. This is somehow comforting to some, but it's not for me. I want to understand this thing! There are roughly 1013 synapses in cortex. Assume each stores one bit of information: that’s 1.25 terabytes. To put this in perspective, this 2.0 terabyte hard drive is readily available and costs less than $900. Also, the Library of Congress (80 million volumes, average 300 typed pages each) contains about 48 terabytes of data. Volume of the human brain: about 1.4 liters. Number of neurons in a human brain: 1012. Number of neurons in a rat brain: 1010. What to take from all this? Simply that the brain is a real, physical object with real, physical limitations. As such, we really do have a chance to understand it. Of course, if the brain is so limited, how can we expect our brains to be up to the task of understanding it? We can, and we will. How can I be so sure? Because (as illustrated above) we have already built, and thus understand, computational devices that are rivaling and in some cases surpassing (e.g., in memory capacity) the computational powers of the brain. This shows that we have what it takes to understand ourselves in the deepest way possible: by learning the neural mechanisms that make us who and what we are. My latest scientific publication is entitled Selection and maintenance of stimulus–response rules during preparation and performance of a spatial choice-reaction task (authors: Schumacher, Cole, and D'Esposito). It is a study using functional MRI with humans to investigate how we prepare for and execute willful action. In this post I'll attempt to translate the article's findings for both the layperson and the uninitiated scientist. Willful action is a set of processes in direct contrast to automatic, habitual, processes. We can say with certainty that you are using willful action minimally when you are resting, brushing your teeth, driving to work for the thousandth time, or while performing any task that is effortless. Willful action is necessary during two types of situations. First, when you are attempting to do something for the first time (i.e., when you've had little practice at it) these processes are necessary for accurate performance. Think of the immense amount of effort while learning to drive. At first willful action was necessary, but later this need subsided. Second, when two potential actions conflict in the brain willful action is necessary to overcome the incorrect action. The conflicting action may originate in an inappropriate desire, a habitual action that is no longer appropriate, or a natural tendency to perform one action rather than another. In this latest publication we have used this last case (conflict due to a natural tendency to respond in a certain way) to investigate willful action. Time magazine has just published an intriguing article on the neural basis of consciousness. The article was written by Steven Pinker, a cognitive scientist known for his controversial views on language and cognition. Scientists have exorcised the ghost from the machine not because they are mechanistic killjoys but because they have amassed evidence that every aspect of consciousness can be tied to the brain. Using functional MRI, cognitive neuroscientists can almost read people's thoughts from the blood flow in their brains. …the biology of consciousness offers a sounder basis for morality than the unprovable dogma of an immortal soul… once we realize that our own consciousness is a product of our brains and that other people have brains like ours, a denial of other people's sentience becomes ludicrous. Evolutionary biologist Robert Trivers has noted that people have a motive to sell themselves as beneficent, rational, competent agents. The best propagandist is the one who believes his own lies, ensuring that he can't leak his deceit through nervous twitches or self-contradictions. So the brain might have been shaped to keep compromising data away from the conscious processes that govern our interaction with other people. Several news articles have come out today which seem to imply that a recent Science report's main finding is that the mind wanders for a purpose (see this Forbes article), and that "daydreaming improves thinking" (see this Cosmos article). These are typical of fabrications used by popular science journalists to pique the public's interest. The two popular news articles mentioned above present these very speculative statements from the article not only as fact but also as the main results of the research, which I find to be disingenuous. Normally, neuroscientists try to discover things about the brain, as if it were one monolithic thing. Might the differences between individual brains be important, or useful? A recent article in New Scientist describes recent efforts to use each person's unique brain activity patterns as a kind of fingerprint (or 'brainprint') for security purposes. The system uses EEG. Freedom to choose is the first axiom of our being. We assume freedom with each action that we take, and we are annoyed when we are forced to act "against our will". A recent article on free will at the New York Times explains that determinism is a direct implication of the brain being the seat of the mind in conjunction with Newtonian physics (also see the recent Mind Hacks post). Why, then, do we assume at each moment that we have free will? How is it that someone could use force and coercion to take away a freedom that we never had to begin with? An increasingly common argument against determinism is based in quantum physics. Certainly Newtonian physics (where every cause must have a pre-determined effect) implies determinism, the argument goes, but quantum physics allows for some 'wiggle room'. Such wiggling takes place at the subatomic level in the form of random movements, such that events in the world supposedly have a base of random chance behind them. I actually find quantum physics to be a negative for free will: I would rather have a predictable and determined will than one that was based on a series of coin flips. At least a determined will allows for the maintenance of a self that can choose (even if the same decision is made every time). But why don't we make the same decision every time? Because we have memory. As the first post on Neurevolution, I would like to review several other neuroscience blogs that have been around for a while. First is Mind Hacks, a blog by the two authors of the book by the same name. According to the authors, the blog and book include "neuroscience and psychology tricks to find out what's going on inside your brain". Many of the topics covered are very similar to those that will be covered here: issues at the edge of cognition and neuroscience. A post of particular interest simply quoted Marvin Minsky (a prominent figure in the field of artificial intelligence) from his book Society of Mind. People ask if machines have souls. And I ask back whether souls can learn. It does not seem a fair exchange – if souls can live for endless time and yet not use that time to learn – to trade all change for changelessness. What are those old and fierce beliefs in spirits, souls, and essences? They're all insinuation that we're helpless to improve ourselves. To look for our virtues in such thoughts seems just as wrongly aimed a search as seeking art in canvas cloths by scraping off the painter's works. I found this quote very moving, as it expresses (by comparison) the wonderful joy of learning and change. It's also profound because it questions certain long-held assumptions about what immortality would be like, and what we would want it to be like. Another post of interest explained how the retina ("the only part of the central nervous system visible from outside the body") and associated structures can reveal a great deal about cognitive functions. It turns out that as items are stored in working memory the pupil dilates (more with each successive item), and as the items are recalled and repeated back to the experimenter the pupil contracts down to its normal size. What does this say about system integration in the brain? It likely means that even low-level regions controlling pupil dilation or eye-movement initiation are tied intimately with regions involved in higher level cognition such as working memory.